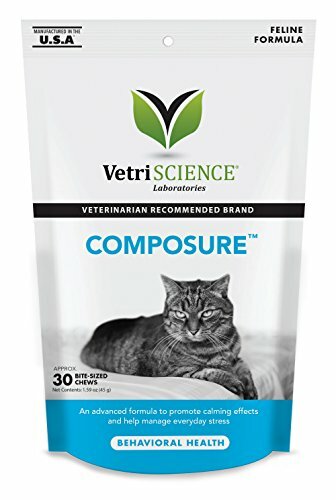 Composure for Cats is a calming formula designed to address nervousness and stress caused by environmental factors such as storms, travel or veterinary visits. Composure uses the natural power of colostrum, l-theanine and thiamine to ease nervousness without sedating your pet. Available in a cat friendly soft chew Composure is easy to administer and provides fast acting relief for nervous felines without changing their personality. 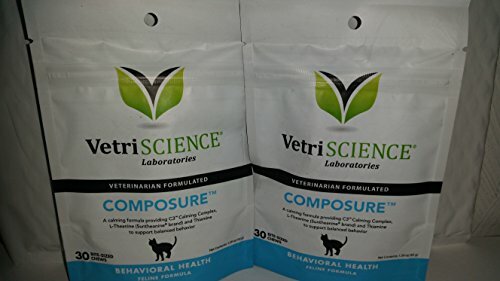 Composure for Cats is a calming formula designed to address nervousness and stress caused by environmental factors like storms, travel or veterinary visits. Available in a cat friendly soft chew, Composure provides fast acting relief. Anxiety, Veterinarian-approved Composure Bite-Sized Chews are used to help calm pets who are prone to anxiety, nervousness, or hyperactivity or who tend to act out when in a stressful environment.